It’s time for the Week 5 edition of the mid-major betting report. 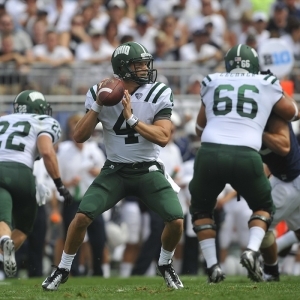 This report focuses on the Ohio Bobcats this season. The Bobcats are off to a 4-0 start in the 2012 season and face Massachusetts this week. Ohio is getting some votes in the national polls, but they’ve yet to crack the Top 25. I’ll be following Ohio beat writers, Bobcats players on Twitter, and team press conferences all season long. By becoming an expert on all things related to this Ohio Bobcats team, I hope to show how specialization is a profitable sports betting strategy. Last year’s mid-major betting report, which followed the Rice Owls, netted $100 per unit bettors $1,280 in profit based on a record of 7-2-1. At the end of each weekly article, I will make a selection for that weekend’s game. Doc’s Sports Unit Betting System will be used for every pick, which should help readers follow along and track the results of these weekly college football picks. There was no selection last week because Ohio faced Norfolk State, a non-FBS school. Two weeks ago, the Bobcats survived a tough test against the Marshall Thundering Herd. Marshall actually had a fourth-quarter lead in that game, but Ohio scored the final 10 points of the game to win, 27-24. Tyler Tettleton threw three touchdowns in that game, but he also injured his hand in the process. Beau Blankenship stepped up with 102 rushing yards. Ohio’s defense gave up 432 passing yards against the Thundering Herd, so that was definitely a problem for the Bobcats. The Bobcats won the game, but my 1-unit selection of Ohio -6 was a loser in that contest for my first loss of the season. Tettleton sat out last week’s game with an undisclosed injury, and it was Derrius Vick who got the starting nod against Norfolk State. Vick threw four touchdowns and didn’t turn the ball over, and the coaching staff was thrilled with his production. Blankenship ran for 109 yards, which put him over the century mark for the second straight game. The Bobcats led 44-0 in the fourth before coasting to a 44-10 victory. How bad of a mismatch was it? Norfolk State was flagged on the first play of the game for having two players on the field with the same number. --Marlowe Alter, sportswriter for WOUB Sports in Athens, reported this week on the Bobcats wide receivers early-season successes. Alter reported that the group of receivers spent a ton of extra time in the offseason working out with Tettleton to try to develop chemistry. The Bobcats coaching staff firmly believes that chemistry between a quarterback and receivers is built mainly around repetition, which is why those units put in so much work together during the offseason. The Bobcats receivers like to say “Flight School” to each other when they break from the huddle to remind them of their bond that was started during the dog days of summer. Wide receiver was supposed to be an area of weakness before the season, but the hard work from the offseason has made this a strength for the Bobcats. --Both Donte Foster and Chase Cochran re-tweeted fans posts regarding the team making its way closer to the Top 25 this week. It’s clear that the team is keeping an eye on the polls, and they are looking to make a big splash this season. -Doug Lesmerises, sportswriter for the Cleveland Plain Dealer, wrote an article this week about how he believes the Ohio Bobcats have the best chance of any team in the nation at finishing the regular season undefeated. Lesmerises said while 27 teams are unbeaten heading into this weekend, he believes the Bobcats are the most likely to stay that way. --Ohio is 5-1 ATS in their last six games overall. --Massachusetts is 1-4 ATS in their last five games overall. --The “under” is 6-1 in the Bobcats last seven games. --The under is 4-0 in the Bobcats last four road games. BookMaker listed the Bobcats as a 23.5-point road favorite at the open earlier this week. The line has ticked up slightly to a current level of Ohio as a 24-point favorite. The posted total opened at 55 points. It has edged down to 54.5. Ohio seems to be staying very quiet about Tettleton’s injury, but it is definitely in question whether he will play in this one. If Tettleton were healthy, I think the line would be 28 points or even higher. UMass was blasted, 45-6, at home earlier this year by a very bad Indiana team. They were also beaten 37-0 at UConn. UMass relies on the run because the Minutemen don’t have much of a passing game at all. The strength of the Ohio defense is the front seven. I don’t think UMass will be able to move the ball much at all against this defense. The Bobcats offense should be able to put up big numbers, regardless of who is under center. The play this week is Ohio -24 for one unit.